Hansgrohe > Croma 220 Air 1 Jet Showerpipe Reno Pack (Chrome). Hansgrohe Croma 220 Air 1 jet Showerpipe Reno shower pack in chrome. With riser rail, rain head, handset and hose. 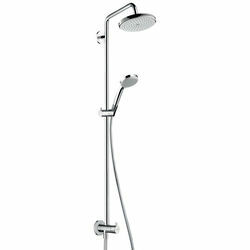 Croma 100 Vario hand shower included with spray type adjustment by turning. Handset spray pattern: Rain, normal spray, Shampoo spray, Massage spray). Hand shower head size: 100mm. 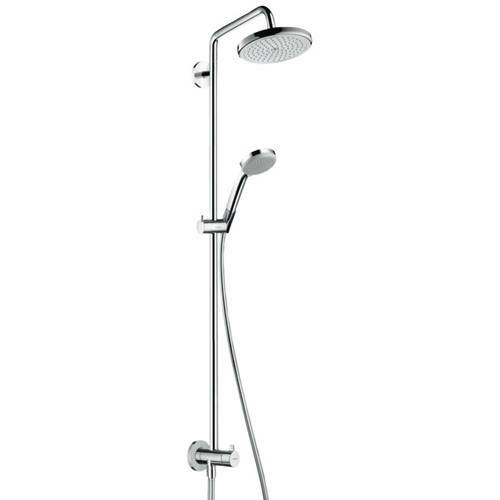 Croma 220 overhead RainAir shower with swivel joint (rain jet enriched with air, 220mm). Shower arm length: 400 mm. Operating pressure: 1 bar to max 6 bar. Flow rate RainAir (at 3 bar): 14 l/min. Requires a separate exposed or concealed shower mixer with independent flow and temperature control. NOTE: Shower valve is not included (sold separately). 5 Year guarantee: Hansgrohe guarantee this shower kit for 5 years.